How to add and delete rows and columns in runtime? 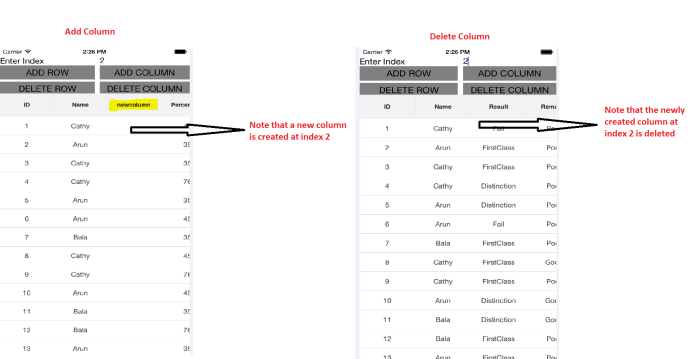 SfDataGrid allows you to add or delete rows and columns from the ItemsSource in run time. When you set the ItemsSource of the grid with a collection that implements the ICollectionChanged interface then the SfDataGrid automatically refreshes the view against the CRUD operations. Refer the below code example in which the SfDataGrid is set with an ObservableCollection as ItemsSource. The ObservableCollection implements the INotifyCollectionChanged interface and hence will result in automatic refreshing of view when adding or removing rows or columns in runtime. 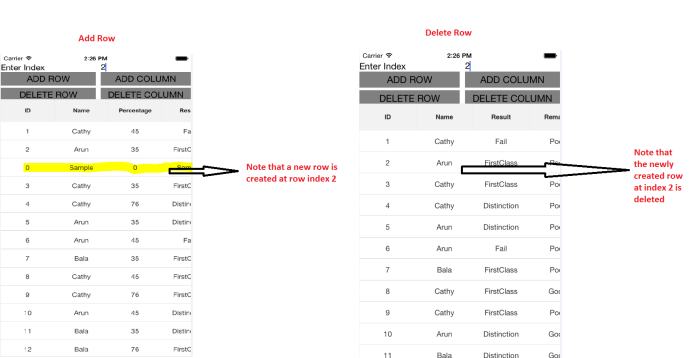 Refer the following code example to add or remove rows and columns in SfDataGrid at runtime. When the ItemsSource of the grid is set with a collection that does not implement the interface ICollectionChanged interface, then the grid has to be manually refreshed for runtime changes.